Vietnam’s cuisine strongly distinguishes itself from the rest of the countries. And of course, taking to the streets and tasting the most unique Vietnamese dishes like a local is an experience no tourists should miss in Vietnam. The cuisine relies on a balance of salty, sweet, sour and hot flavours, achieved through use of a fermented fish sauce, cane sugar, the juice of citrus fruit or tamarind and chilli peppers. But you don’t need to worry about them being overly spicy, as chili sauces are usually served separately. 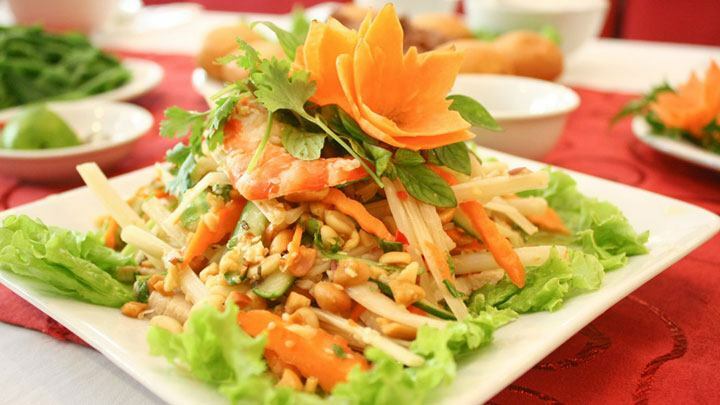 Here are the top 10 Vietnamese delicious dishes that promises to make your taste buds go gaga. “Cheap, delicious, filling and widely available” is how people describe fermented pork skewer. The pork meat is cut into pieces, fermented and then grilled on a small charcoal bowl. It sounds a simple process but you need to put much attention to make a hand-to-mouth pork skewer. In addition, eating Nem lui with vegetables balances the taste, especially chillies, which plays a vital role in every Vietnamese foods. The most distinctive feature of summer rolls is that they are not wrapped in wheat dough like egg or spring rolls, but actually are wrapped in a special kind of rice paper, that has been eaten in Vietnam for centuries. Translucent spring rolls packed with greens, coriander and various combinations of minced pork, shrimp or crab. In some places they’re served with a bowl of lettuce and/or mint. A close relative of the summer roll is known as “chả giò” in southern Vietnam and “nem rán” in the North. These are savory meat rolls (containing minced pork, mushrooms, and herbs) that are fried until the rice-paper wrapper is crispy and brown. Can cake is a similar shape to Khot cake, but it is made quite differently. While Khot cake uses a fried rice flour, Can cake is made of pure rice with the filling of spring onion. What makes it special is that the cake is cooked in small earthenware pots without oil. When the cake is well-cooked, it inflates and becomes crispy. This dish is rarely served with sauce, meatballs, crackers on top, and vegetables, including green mango, onion and cucumbers. The sauce is made from fish sauce mixed with garlic and chilli. Can cake is dipped fully into the sauce to eat. 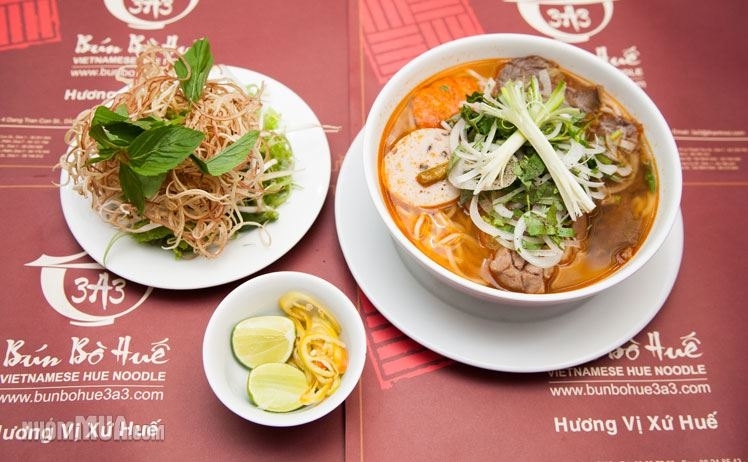 It is one of the most popular Vietnamese soup containing rice vermicelli and sliced cooked beef and is greatly admired for its unique balance of spices and flavour. The base of the soup is pork and beef bones, a kick from lemongrass, annatto and shrimp paste, and finished with a tangle of herbs, a squeeze of lime and a few delicious add-ons like sliced brisket, crab balls and, in some cases, cubes of congealed pig’s blood. We make sure that these flavors are deep and rich, providing a satisfying meal that will fill up most diners for several hours. Chè, pronounced familiar to “chair,” refers to any Vietnamese sweet dessert soup, known for its many varied sweet soup types with different ingredients, colors, forms and tastes. Che is often prepared with one of a number of varieties of beans, tubers, fruits and aloe vera, cooked in water and sweetened with sugar. All of them have original outstanding flavors that you can’t stop eating. In southern Vietnam, che are often garnished with coconut cream. Nom Hoa Chuoi is a great meat-free option. Lime and chili are the key flavors and add a refreshing punch to the shredded veg. The cooking begins with the tough, outer layers of the banana blossom peeled off and discarded, which make delicious with the most of the subtle flavor of herbs, the crispness of banana blossom, and big ears, the chewy and tender taste of chicken, the nutty flavor of roasted peanut and the harmony of the seasoning…It is such a lifetime experience being exposed to its explosion of different flavors and amazing texture contrasts. 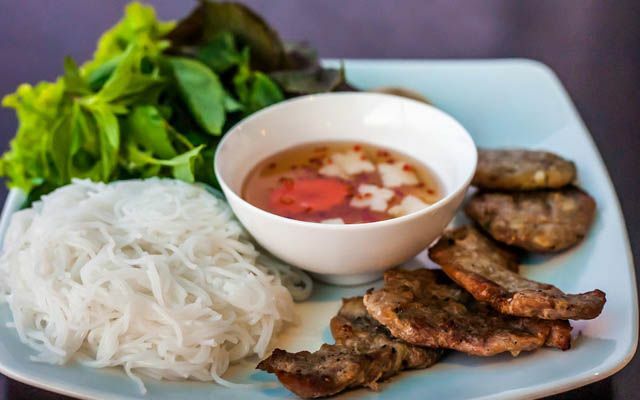 It doesn’t matter if you eat bun cha in a restaurant or a small cart on the the street, you will be served by a plate of vermicelli (bun), a bowl of broth with grilled pork and a basket of fresh greens in which you will find fresh lettuce, Thai basil, cilantro, fish mint, banana flower and coriander. Without them, Vietnamese dishes are not be complete. 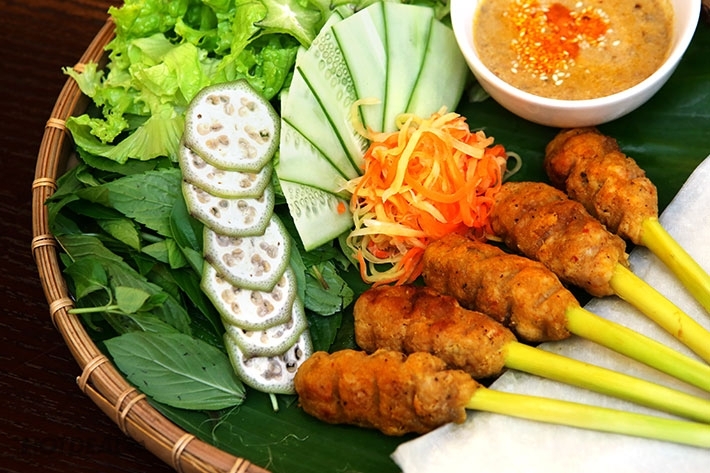 Bun cha is a local dish originally from HaNoi, the capital of Vietnam. Throughout Vietnam you can find a lot of dishes that has the same formula as bun cha, however, the dish’s is unbeatable. It doesn’t matter if you eat bun cha in a restaurant or a small cart on the the street, you will be served by a plate of vermicelli (bun), a bowl of broth with grilled pork and a basket of fresh greens in which you will find fresh lettuce, Thai basil, cilantro, fish mint, banana flower and coriander. Without them, Vietnamese dishes are not complete. Bun cha is a local dish originally from HaNoi, the capital of Vietnam. Throughout Vietnam you can find a lot of dishes that has the same formula as bun cha, however, the dish’s is unbeatable. These delicious Banh Beo is the Vietnamese version of tapas. They are made and served in these tiny ceramic plates, packed with enormous flavors. These are steamed rice cakes, about the size of a silver dollar, that come five pieces to an order, topped with dried shrimp, pork cracklings, shallots, herbs and served with fish sauce. Its a dish that should be at least tried once. One of favorite food in Hanoi – Vietnam capital is Vietnamese Mixed Pho. This dish is so popular and delicious. Its taste is completely different with traditional Pho. Although the cooking styles and ingredients of this dish is similar with Ho Chi Minh’s noodles, it have distinct taste you may ever have. Noodles are put into the bowl with some pork chop, herbs, peanuts and dried scallions, and then add some sour sauce to make it more delicious and has a different taste. This sauce is most important ingredients to make this dish delicious. Each vendor has a different way to make this sauce and they keep it as a secret cooking. 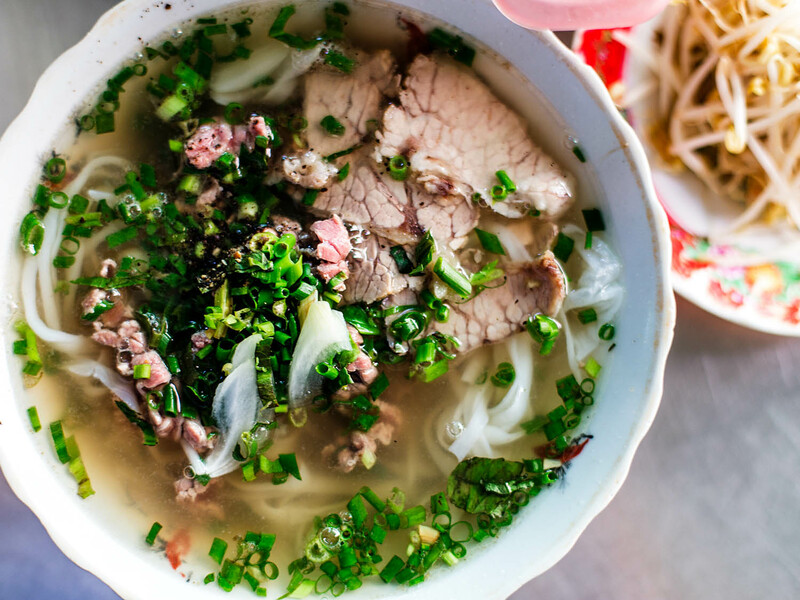 There are hundreds of cuisines which are developed and adapted throughout Vietnam, but these 10 are the must tries if you stay or visit Vietnam. We welcome you to try these dishes and discover the flavors of the timeless charm. Celebrating Christmas in Vietnam? – Here are some things you can do!